We provide superior quality Para Dichloro Benzene in the industry. Known for their efficient work in various industrial applications, the Paradichlorobenzene Flakes made available by us are pure in content and specifications. They are formulated at our highly advanced laboratory by the experts. 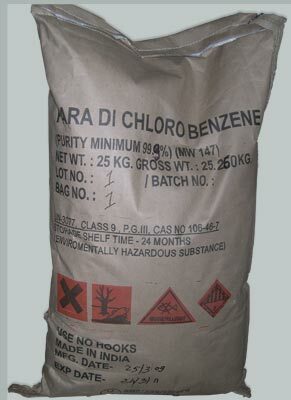 Para Dichloro Benzene is used in Insecticidal Fumigant and is also popular for domestic use against moths. Besides, we are a trusted Paradichlorobenzene Exporter and one of the reliable Suppliers of the same. Solubility Clear solution in Acetone, Soluble in alcohol ether, benzene, Chloroform, Carbon disulfide. Insoluble in water. Application : Insecticidal Fumigant, Popular for Domestic use against moths. Packing :25 / 50 kg HDPE/ Multi layer paper bags with double HMHD Liner.